Converseen is an open source project written in C++ with the powerful Qt4 libraries. Thanks to the Magick++ image libraries it supports more than 100 image formats. 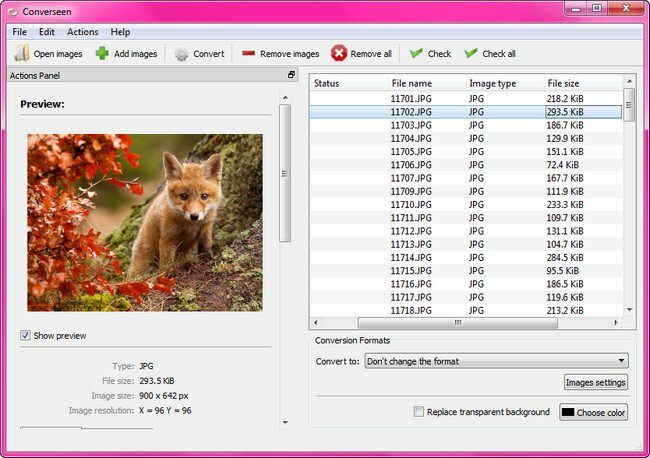 You can convert and resize an unlimited number of images to any of the most popular formats: DPX, EXR, GIF, JPEG, JPEG-2000, PDF, PhotoCD, PNG, Postscript, SVG, and TIFF. With Converseen you can save your time because it allows you to process more than one image with one mouse click! Converseen is very simple: it features a very simple user interface without strange options. On the design side of things, Converseen doesn’t excel in any particular aspect. Its interface is simple, straightforward and has a comprehensive layout. Once you load the images into the application, they are displayed in a list and clicking one opens a preview for it. In the same main window, you have access to the features that allow you to resize, rotate and rename the images, as well as choose the new format you want for them. Everything you need is easy to access and should pose no challenge to you, regardless of your experience with computers and software in general. Converseen enables you to perform one of the most frequent modifications made to an image, meaningly to change its dimensions. The application allows you to reduce it by decreasing the scale of the image in percentage or by manually entering the width and height for the new resolution. Since it’s easy to stretch an image vertically or horizontally to an undesired effect, Converseen allows you to maintain the aspect ratio of the photo with a simple click. In case the image was downloaded to your computer with an incorrect orientation, the application also offers you a function to rotate or flip it over its vertical or horizontal axes.